Want to quickly build a list of subscribers who are just hungry to buy from you? "Would Trade Just One Medium-Sized Cheese Pizza To Discover 7 Simple, Yet Powerful Ways, To Rake In More Ultra-Responsive Subscribers Anytime You Wish?" You've heard it over and over again - "The Money's In The List". Sounds too much like a cliché nowadays doesn't it? You've been bombarded with emails telling you that "You need your own list". You know what? I'll hand you a list for FREE. How would you like that? Simply grab a phone directory. There's your list. Now start making money. Listen, although the phrase "The money's in the list" is true - I don't totally agree with it. What you need is your own ultra-responsive list. By that I mean subscribers who can't wait to receive all your emails. I've been in many businesses before such as MLM opportunities and it came down to this - It's all in the numbers game. •A list of 100 responsive subscribers will only generate you 2 sales at a conversion rate of 2%. •A list of of 1,000 responsive subscribers will generate you 20 sales with the same conversion rate. 1000, 7000, 10,000 or Even More? Many people ask the same questions over and over again. Why should I build my list? What is the best way to build my list? •ebooks - I've read some that were even 100+ pages. •Reports - Yep, most of them were filled with sales-pitches. •Articles - Wasn't very helpful. •Home-study Courses - Great information but who has the time to do 30 or so steps? •and even Internet marketing seminars! I even tried "buying" those 100,000 instant list of subscribers pack only to find that most of those subscribers are unresponsive to any of my emails. Yes, I did "warmup" those fresh subscribers but was wasting a whole lot of my time. The best way to build your list is by simply getting 100% optin subscribers. Those who've actually requested to receive your information. I could easily give you 30 ways to build your list but no. ...so I've boiled everything I've learnt about list building into just 7 of my best list building strategies. "7 Ways To Generating Unstoppable, Targeted Subscribers In Any Market!" •I'll share with you the exact methods I used to build a list that keeps growing 24/7 on autopilot without the fluff, gimmicks, hype and craziness. •You'll learn how to convert 17.7% of your unique visitors into hungry subscribers of yours by simply adding this powerful weapon. •Would you exchange 10 min of your time for an extra 7, 20, or even 40 subscribers a day by simply applying this simple technique to boost your list? I'll give you full instructions on how to do it and I'll even give you examples of how I use it. •How to rapidly build your list using this simple technique most marketers aren't taking advantage of. It'll only take the afternoon to put together and then the rest is autopilot. It's free traffic and advertising for you to build your list in "turbo mode". Hungry Subscribers That Join 24/7, Virtually on Autopilot! •Get involved with as many __________ as possible. This list booster alone has built me an army of over 1,000 subscribers in less than 14 days. I'll show you proof (screenshots of my autoresponder - not many marketers will show you this). I now have an extra 1,000 - 2,000 subscribers I can market to which I didn't have a few days before. •The one thing you MUST add in order to maximize your subscriber list. I see so many marketers not doing this. You may be a victim of this as well. I just don't see why they don't do it. •How to start your own traffic virus to build your list. I'll show you step-by-step what tools you need (free), and how to blast it off to a hungry market. The results are just unstoppable. When you download and listen to List Boosters you'll be able to begin using these strategies immediately to see an instant increase in your results. 3.Starting a "survey campaign", asking questions to help you tailor make your next product, ask for testimonials for your product and much much more. 1.Sending other Mailings of any kind! How Much Would You Invest To Learn How To 'Boost' Your List To Increase Your Monthly Income? Here's the thing...I'm providing you with SEVEN ways to boost your list size so you can make more sales, get more marketing partners, share your tips and more. How much really can you make with an extra 1,000, 7,000 or more subscribers? $500, $1000, $5000 more to your monthly income? Really, you can't put a price tag on these valuable tips I'll hand to you. They are my seven weapons to building 100% optin list. I could easily charge you $37 for the information I'm about to share with you, but I'm not going anywhere near that because I honestly want to show you what content I can deliver to you time and time again. So I'm going to hand you my 7 List Boosters for $37 $27 $9.97! That's less than you'd pay for a medium cheese pizza! It's information you can use immediately...it's not a long 100+ page ebook where you need to figure out what to do next. I've made it to-the-point and as short as possible. Simply put, it's full of meaty content in only 26 pages - no useless information! Don't worry, you're even backed by my Iron Clad, no questions asked, "you can't lose", 60-Day Money Back Guarantee! 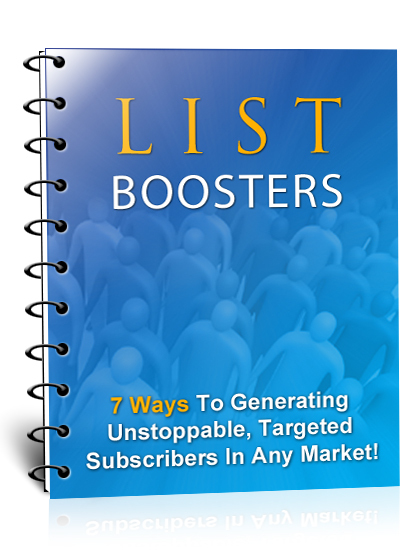 List Boosters comes with a no-hassle, no questions asked, 60 day money-back guarantee. If you decide that this is not right for you, simply email me and I'll buy it back off you! Now that's more than a guarantee -- that's a promoise. I believe that these strategies will work for anyone and that I think that you'll make an honest effort to read & apply the strategies I'll be giving to you. You'll see immediate results by applying anyone of the 7 List Boosters I'll share with you. You have nothing to lose and so much more subscribers to gain! What are you waiting for? Here's the thing that really makes sense about this: If you just find ONE idea among these 7 that you didn't already know and put it to work for you, it's well worth ten bucks! There's really nothing left to "sell" you on. It's risk-free. It's ten bucks. It's an opportunity to learn 7 simple things you can do to maximize your list.